Type in a name or a place. You are invited to browse these pages in search of answers to your questions. Although I offer this information, please be aware that I do not guarantee its validity. My name is Gina Armstrong Heffernan and I am relatively new to Rusk County but my family has lived here for over one hundred years. I would love for you to submit your information to be included. If I should leave this position as coordinator, your information will remain as part of this library for my successor. I am not able to do lookups at this time but I might be able to help in other ways. 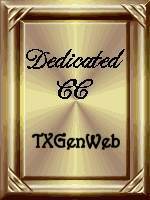 This site actually incorporates parts of three sites.This page is part of TXGenWeb, which is affiliated with USGenWeb. In an effort to collect information and store it permanently in one place, we have created the USGenWeb Archives. In addition, we are now storing pictures at the Texas Tombstone Project. I have links to the two sister sites and you can search those sites from one central search page. This award was won by Gloria Mayfield. Mike Basham Memorial Award pages. visit the Orphan County page.